The season of Halloween and an ideal time to share with you my magic potion! 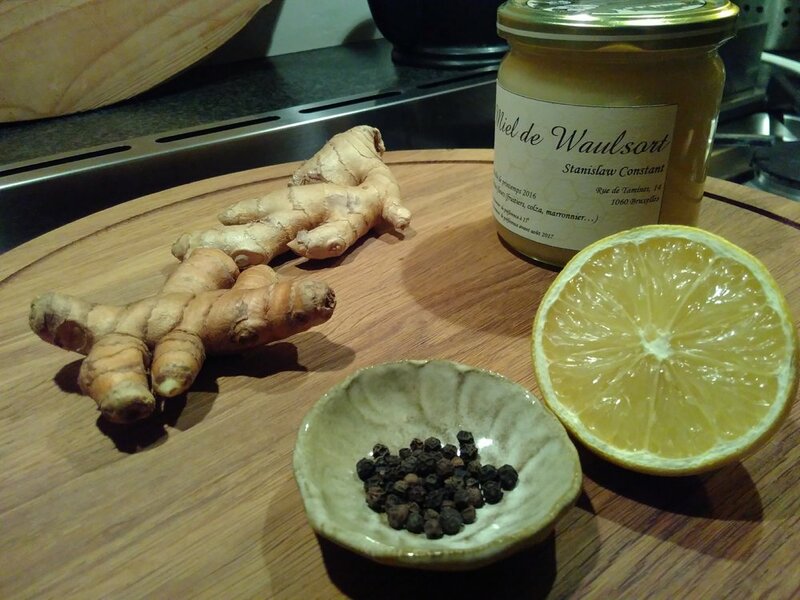 For a long time it was hard to get hold of root turmeric but now it is available in most health/organic shops in Brussels... at this time of year I always have a bit in the fridge alongside some fresh ginger root. Take a good size piece of turmeric root and ginger root and peel and chop them - careful the turmeric turns everything orange so you might want to protect your hands. Add them into cold water with a few whole black peppercorns. Heat slowly until water is boiling and then continue to simmer for about 10 minutes. When ready pour into a mug (I leave all the bits of spices in the pan) and add juice of half a lemon and a spoon of local organic honey. The pan of potion lasts for a few days - just keep adding water and heating up - it gets even more spicy and powerful as the days go by!